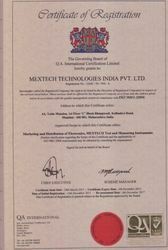 "Mextech Technologies India Pvt. Ltd.", was established in the year 2009 with an aim to cater to the needs of our clients by Wholesale Traders & Traders in Laboratory Testing Equipment such as Digital Clamp Meters, Automatic Anemometers, Analogue Clamp Meter & Many more. Our comprehensive range includes Digital Multimeter Earth Resistance Clamp Meter, Insulation Tester, Electrical Testers, Sound Level Meters, Anemometers, Gas Detectors, Weather Station, Rain Gauge, Light Meters, Thermo Anemometers, Thermo Hydro Meter, Hour Meters and Digital LCR Meters. Further, we also offer products like Thickness Meters, Grain Moisture Meters, Wood Moisture Meters, Oscilloscopes, Frequency Counters, Function Generators, Coating Thickness Gauge and Tachometers. We are ISO 9001:2008 Certified company. Our team conducts proper market research enabling us to establish fruitful relationship with our vendors. Further, our quality auditors undertake tests on different parameters to ensure that the product delivered is of highest quality. Our range is stored at spacious warehouse to protect it from environmental factors. All these characteristics of our organization has enabled us to cater to the clients from automotive, aerospace, medical and various other industries. Under the able guidance of 'Mr. Anish Shah', we have been able to carve a distinct image in the trading of quality products. Our team has gained an immense experience and knowledge under his leadership. Trading of a quality range of Laboratory Testing Equipment. We are backed by professionals, who are self driven & enthusiastic and regularly assesses the current methods of working & try to incorporate new methods. These professionals are hired after a proper scrutiny of their knowledge and experience. These professionals work in close coordination and are provided training on regular intervals to make sure that they well aware about the changing scenario of the market.